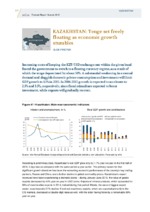 Increasing costs of keeping the KZT/USD exchange rate within the given band forced the government to switch to a floating currency regime, as a result of which the tenge depreciated by about 50%. A substantial weakening in external demand and sluggish domestic private consumption and investment will limit GDP growth to 1.5% in 2015. In 2016-2017, growth is expected to accelerate to 2.5% and 3.5%, respectively, since fiscal stimuli are expected to boost investment, while exports will gradually recover.